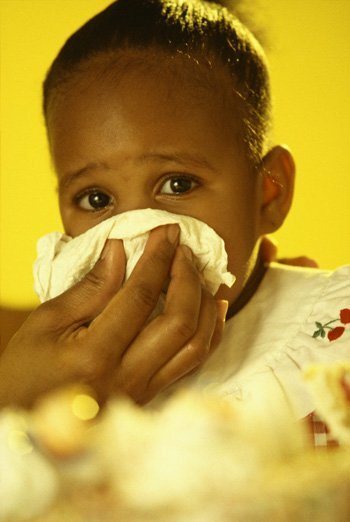 Have you ever taken your child to the Emergency Room to get the diagnosis of an upper respiratory infection? Before getting too alarmed, remember that this is another name for the common cold. There are more than 200 serologically different causative agents, the most common being rhinoviruses, coronaviruses, parainfluenza virus, enteroviruses, adenovirus, influenza virus A and B, respiratory syncytial virus, and group A streptococci. The clinical picture typically includes fever, runny nose, sneezing, and nasal congestion with clear or purulent nasal secretions, a sore throat lasting for several days, and a self-limited clinical course of 4-10 days. Streptococcal infection may be present as a seromucoid rhinitis in toddlers. Associated symptoms may include irritability, restlessness, muscle aches. cough, eye discharge, vomiting, or diarrhea, depending on the causative agent. Otitis media with effusion, laryngotracheobronchitis, or bronchiolitis may be present. Complications are typically attributable to bacterial superinfection and include sinusitis, cervical adenitis, mastoiditis, pertonsillar, and periorbital cellulitis, otitis media, and pneumonia. The treatment of nasopharyngitis consists of bed rest, increased intake of fluids, and the administration of acetaminophen or ibuprofen for pain and fever. Because of the risk if Reye's syndrome with influenza infection, aspirin should be avoided. Oral decongestants, oral antihistamine and nasal suctioning are appropriate for infants with nasal obstruction. Humidifiers and vaporizers may be useful to prevent drying of secretions.